Digitaria sanguinalis plants. © 2014 Katy Chayka. Minnesota Wildflowers. minnesotawildflowers.info (Accessed 3/2018). 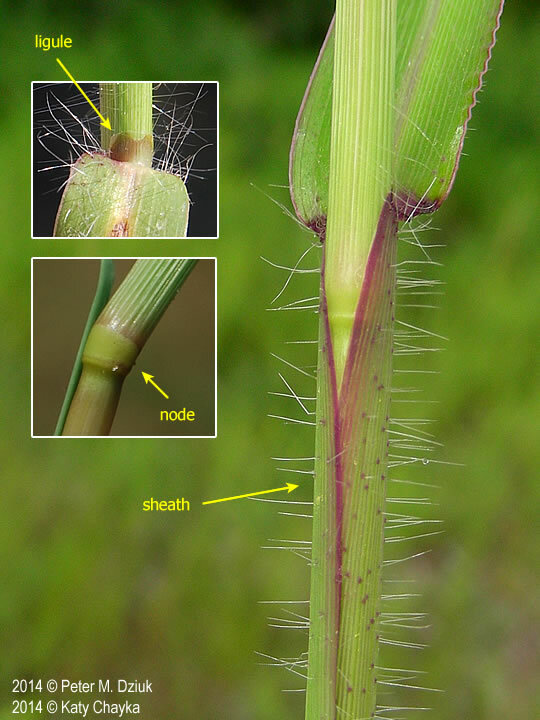 Digitaria sanguinalis ligule, node, sheath. 2014 © Peter M. Dziuk, 2014 © Katy Chayka. Minnesota Wildflowers. minnesotawildflowers.info (Accessed 3/2018). Digitaria sanguinalis is a summer annual; C4 grass (Downton 1971), tufted, stems branched, reclining, spreading in rosettes, 30-60 cm, rooting at nodes as stems elongate, stems of older plants often dark red or purple (Uva et al. 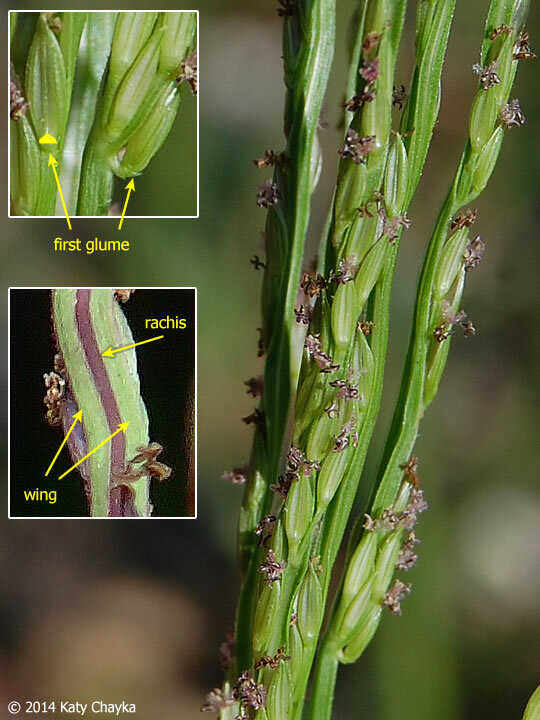 1997); nodes and sheaths hairy, ligule membranous, edge ragged. Digitaria sanguinalis lower leaves. © 2014 Katy Chayka. Minnesota Wildflowers. minnesotawildflowers.info (Accessed 3/2018). Leaves hairy on both sides, especially above, 5-15 cm long, 0.4-1 cm wide, bright green. Digitaria sanguinalis flowers. © 2014 Katy Chayka. Minnesota Wildflowers. minnesotawildflowers.info (Accessed 3/2018). 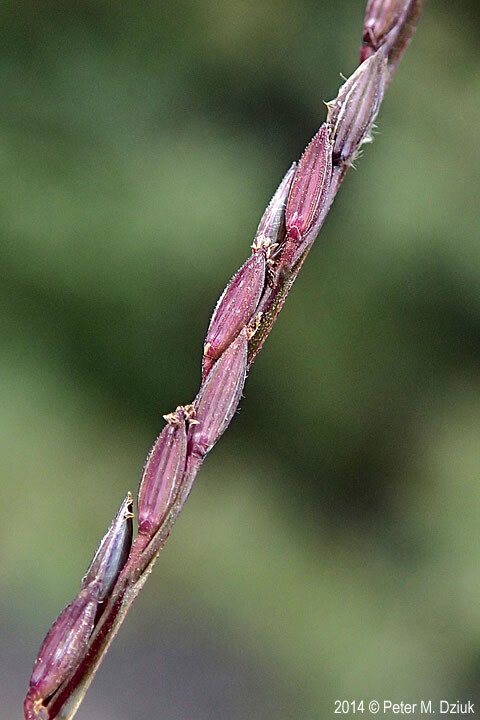 Flower spikelets in two rows along spike, elliptic, 1-flowered, about 0.3 cm long, in pairs, first glume minute or none, second glume shorter than sterile lemma, fertile lemma grayish-brown; inflorescence of 3-13 spikes 5-15 cm long, in whorls at top of flowering stalk; blooms and fruits July-Oct.
Digitaria sanguinalis mature spikelets. 2014 © Peter M. Dziuk. Minnesota Wildflowers. minnesotawildflowers.info (Accessed 3/2018). Fruit: Seeds eaten by many birds and small mammals (Martin et al. 1951). 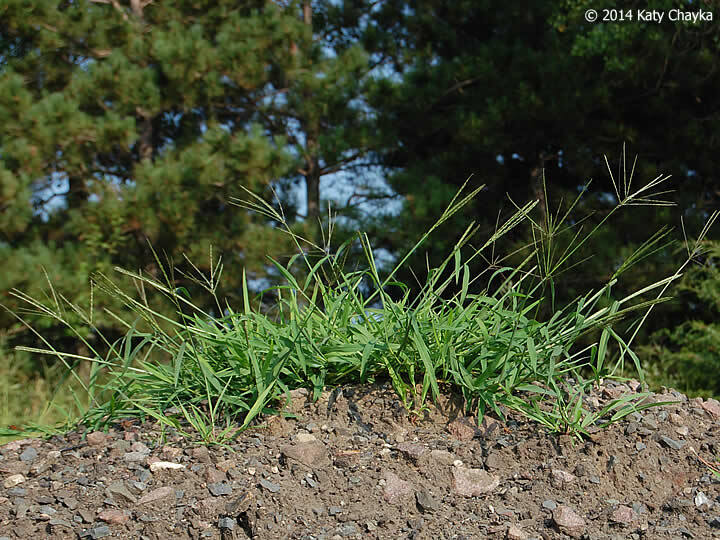 Habitat: Very common agricultural weed in lawns, gardens, along roadsides, vacant lots, and on fill. Soon shaded out by taller vegetation in unmowed habitats. 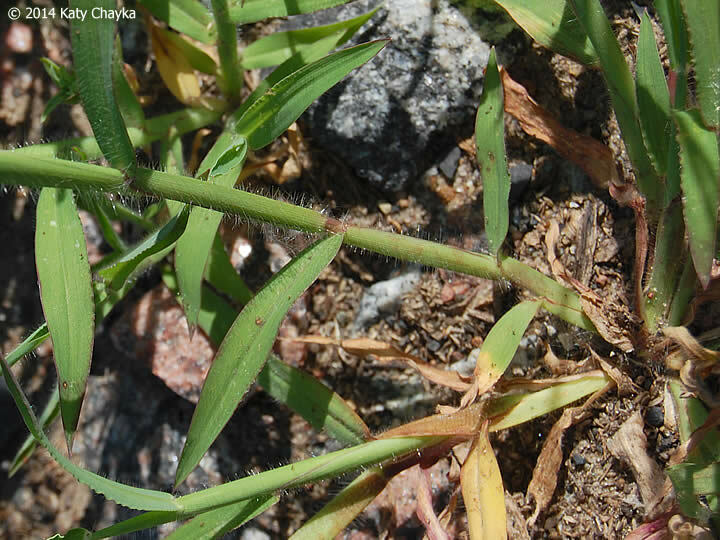 Similar to Eleusine indica but Digitaria has flat leaves.